Ultrasonic: Most ultrasonic humidifiers use a metal diaphragm vibrating at an ultrasonic frequency to a continuous mist that is dispersed into the room to help maintain the desired humidity level. An ultrasonic humidifier is virtually silent when operating, and mist output is immediate. Air Washers: Discs rotate in a water chamber inside the air washer. This process both humidifies and cleanses the air passing over the discs. Large dust particles are captured in the water chamber. The process is not dissimilar to the allergen clearance in the air after a good rain fall. The humidification of the air uses the self-regulating principle of cold evaporation. You need to choose a humidifier which is large enough to humidify the space required, bearing in mind manufacturers consistently exaggerate room coverage, so buy larger capacity model than you think you need, especially if you have high ceilings over 8 ft.
Then decide which features are most important to you, whether it is quiet operation, ease of fill and cleaning, or cost of yearly maintenance. These are the main drivers in people’s decision making, but there are additional factors below to consider. 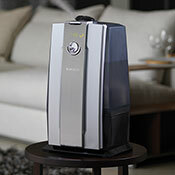 An ultrasonic humidifier is the most popular humidifier in the US and especially in the Northeast. They have the quietest operation of any kind of humidifier and most ultrasonic models offer both a warm and cool mist option. Neither a warm mist or cool mist is more effective in humidifying a room, it is purely preference with warm being slightly warm to the touch and cool mist being about room temperature. An air washer is marginally more expensive at the outset but makes up for it with little or no annual maintenance costs and its longevity could easily reach ten years. Air washers have the added benefit of the air being purified, at least from larger dust particles suspended in the air. You would also likely choose an air washer if you are in warmer climates or have hard water. Air washers undoubtedly cover much greater space than any other type of humidifier and in a modest sized apartment can be set in the living room and cover all rooms. Evaporative humidifiers are clearly a good choice for your money if you are humidifying a large room or open space in your home. They is no risk of them producing white dust but you will need to change the wick on a regular basis. We recommend keeping a humidifier running constantly if you have a large area to cover in order to keep the space at the desired humidity. If your goal is to humidify a bedroom, turning it on two hours before bedtime should be sufficient. We advise setting a humidifier to between 35 to 45% humidity level. Over 50% can cause mold and dust mites to proliferate. Place a small to mid-sized humidifier off the floor and place it on a table at the far side of your bedroom. This reduces noise level and prevents your bedding from becoming damp. If you are concentrating on night time comfort, choose a room humidifier, otherwise a central humidifier or large space evaporative humidifier is a better choice than multiple small units. However, there must be sufficient airflow between rooms to work. Built in humidistat: Humidistats that are integrated into a humidifier can be inaccurate at times and it will depend on the temperature of your room and if there is an open door or window. For absolute accuracy, purchase an additional inexpensive standalone measuring device called a hygrometer. That being said, built in humidity display levels are useful to avoid over humidification. Noise level: some humidifiers are notoriously noisy, and for some people the white noise that they emit is sleep disturbing. Ultrasonic machines are the quietest. A variable fan control which you can control. No mineral dust: if you live in a hard water area, you may be at risk for generating white dust with a humidifier. While this can happen with an ultrasonic humidifier, it can be prevented using distilled water or a mineral dust prevention cartridge. Coverage: most manufacturers coverage specifications are overstated, so choose a humidifier with more square footage than you need. This means more gallons of water in its holding tank. Automatic shut off: when the humidifier has reached the required level of humidity it should shut itself off, and should also shut itself off when empty. Bacteria free: is there integrated bacterial protection or an inserted protective device? If you don’t have this feature on your humidifier, you will need to clean it out very often to prevent mold and mildew. Ease of cleaning: every humidifier needs maintenance during the season. Do the parts come apart easily for dishwasher cleaning? Cost of maintenance: look carefully at the annual cost of maintenance for your humidifiers. 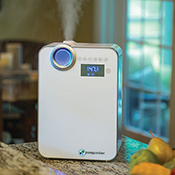 The annual humidifier replacement kits cover demineralization and anti bacterial protection. Reputable manufacturer. Your safety and that of your family is paramount importance so make sure to choose a reliable humidifier that has not a recall. 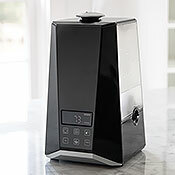 None of the humidifiers that AllergyBuyersClub offers have a recall in their history. Warranty: a good humidifier has a warranty for three years and expected to last for five years.